A specially designed posture correction seat for transit drivers, truck drivers and for divers of industrial vehicles. Customizable backrest with a firm seat stands up to heavy use. The seat is wider at the front than at the rear to support the legs toward the front of the seat when applying pressure to the pedals. Rubber suspension frame absorbs road vibrations. Flexible backrest can be shaped to fit your individual spinal contours. Adjustable lumbar pad can be completely removed or repositioned. If your natural lumbar curvature is average or flat, you may be more comfortable without the pillow. 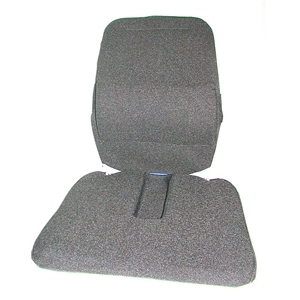 1" firm polyfoam seat prevents slumping down and forward into sagging truck seats. Coccyx relief cut away relieves pressure in the tailbone area. Durable non-skid seat bottom keeps the seat in place.